Joe Schobert is everyman. Even when he’s a Pro Bowler. Schobert arrived in Orlando, Fla., in January expecting the five-star treatment that accompanies the NFL all-star game. “I wasn’t on the list for the bus,” he told The Chronicle-Telegram on Friday. When that misunderstanding was resolved and Schobert was chauffeured to the plush hotel, he was charged for the room. Schobert is an anomaly in an NFL locker room. He wears an old-school Browns Starter jacket, relaxes on his day off by walking nine holes and can talk Harry Potter for hours. If he weren’t the starting middle linebacker with three takeaways in five games, he’d be mistaken for a ball boy. No wonder his favorite superhero is Captain America. Schobert (6-foot-1, 230 pounds) always believed he’d be making plays in the NFL, even if the experts gave him no chance. Despite being a three-sport star, he got no Division I offers out of Waukesha West High School in Wisconsin. Rux called Schobert the best pure athlete in school history. He was an all-state running back and safety, a two-time all-conference selection in basketball and finished third in the state high jump. He takes pride in his gifts and accomplishments and lights up when talking about the early dunks that shocked opponents and the 6-2 high jump that won conference after he sat out the season and rushed from a doctor’s appointment. He cleared 6-6 in sectionals. The athleticism is on par with that of his Pro Bowl teammates but continues to get overlooked and underappreciated — until you watch the through-the-legs dunk video, or step on the court with him. That rare ability and the success he experienced in all sports growing up gave Schobert the self-confidence to have faith in his NFL dream while being ignored by the school of his dreams down the road in Madison. He was headed to play at North Dakota and looked up players from the school who’d played in the NFL as confirmation it could be done. A late state all-star game changed the path but not the destination. He was the self-described best player on the field, and all of a sudden the University of Wisconsin was interested and took him as a preferred walk-on. Schobert likes to point out that rookie sensation Baker Mayfield isn’t the only former walk-on starring for the Browns. He quickly stood out with the Badgers, started 28 games and was an All-American. The Browns drafted him in the fourth round in 2016, No. 99 overall. Former head of football operations Sashi Brown drafted Schobert to play outside linebacker in a 3-4 scheme, but he was undersized and struggled as a rookie. His career took off when coordinator Gregg Williams arrived in 2017, moved him to middle linebacker in a 4-3 and let him play in space. He tied for the NFL lead with 144 tackles. “It’s helped me take a huge jump so far,” Schobert said. In his second year calling the plays, he’s in sync with Williams, out of his own head and able to play faster and freer. The difference is obvious, particularly in splash plays, as he has a team-high 46 tackles, two fumble recoveries, an interception, a forced fumble and four passes defensed. Schobert will match wits Sunday with veteran Chargers quarterback Philip Rivers, as each tries to get his side into the best situation as the seconds tick down before the snap. Schobert’s most impressive feat is playing every snap for the last 21 games. He’s continued the streak despite three overtime games in Cleveland’s 2-2-1 start, totaling 392. The Pro Bowl hasn’t gone to Schobert’s head. Rux said when he returns to the high school he’ll go straight to the math teacher or French teacher or show up in the weight room unannounced. When he held a camp this summer he worked it for eight straight hours rather than delegate to the high school coaches. Schobert’s comfort in his own skin is most obvious in his love of all things Harry Potter. “Probably a bigger fan than anybody else you know,” he said. During the Pro Bowlers’ private use of Universal Studios, he and wife Megan went to Diagon Alley. “I think they were the only ones there walking around,” Rux said. The love carried over from childhood. On vacation in Missouri, Schobert’s family drove an hour and a half to buy the sixth book when it came out. He read the seventh book on a baseball trip to Myrtle Beach and didn’t need 24 hours. “I was sad that the whole thing was over,” he said. Yet Schobert fits with his teammates. 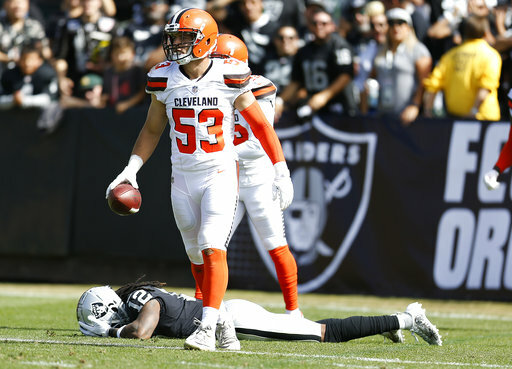 The Browns can’t negotiate a contract extension until Schobert’s third season is over in December. He’s looking forward to getting it done.